Travel rewards programs change from time to time, and rarely are these changes for the benefit of the customer. That’s why today’s announcement by Wyndham Rewards is so shocking. In short, Wyndham is getting rid of all of their award tiers. One free night in a Wyndham-portfolio hotel can currently run anywhere from 5,500 to 50,000 points. Instead, the company will now be charging a flat rate of 15,000 points for every hotel worldwide. Now this of course means that cheap 5,500 point nights will suddenly cost 3 times as much, so book those ASAP if you had any in mind. On the flip side, rooms at 50,000 point levels are suddenly going to cost a whole lot less. 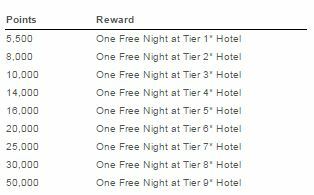 There are lots of Tier 6, 7, 8 hotels that will be much cheaper to redeem than before. What is a go freeaward? A go free award is a redemption option that will allow you to use Wyndham Rewards points to redeem for a free night stay. >The go free award will be valid only for the room rate for one (1) single or double standard hotel room for up to the maximum occupancy of the room, including local taxes but not including incidental charges, except in the case of all-inclusive participating Wyndham Hotels and Resorts properties, where a go free award will also include meals and other amenities for up to two (2) guests for the free night. 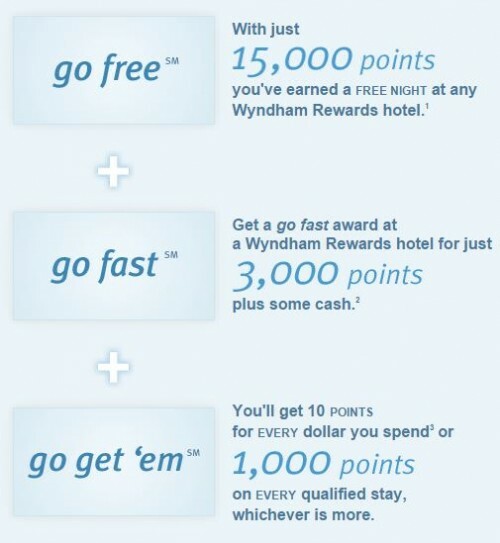 See revised Wyndham Rewards program terms and conditions on or after May 11, 2015 for more details, including information on cancellation policies applicable to go freeawards. How does a go freeaward work? Our go free award will replace our Free Night Stay program. The go freeaward will allow you to redeem 15,000 Wyndham Rewards points for one free night at any of our participating hotels worldwide – any standard room (up to max. occupancy), any participating property, down to last room available. No blackout dates. The go free award will be valid only for the room rate, including local taxes but not including incidental charges, except in the case of certain participating all-inclusive properties, where a go free award will also include meals and other amenities for up to two (2) guests for the free night. See revised Wyndham Rewards program terms and conditions on or after May 11, 2015 for more details, including information on cancellation policies applicable to go free awards. Do go free awards have any blackout dates? No – there will be no blackout dates to redeem 15,000 points for a free night for any available standard room at any of our participating hotels worldwide. A couple of years ago, Wyndham Rewards went through a major devaluation with no notice that upset a lot of people. I myself had points I had purchased through Daily Getaways suddenly have their value slashed. With today’s news, I’m glad that I never got around to redeeming the rest of those points, as I suddenly have enough points for 2 free hotel nights in some nice hotels in expensive places. Of course, the FAQ does mention “participating hotels” – hopefully there won’t many exclusions as a result. While Wyndham isn’t the most luxurious brand overall, they are working on getting into the space, especially with their recent purchase of Dolce Resorts. Now I just wish they were participating in Daily Getaways again this year so I could get more points for cheap! This brings up the question of whether or not the Barclaycard Wyndham Rewards Visa card is now a good deal. Currently, you can get 30,000 Wyndham Rewards points after making your first purchase with the card, plus an additional 15,000 points for spending $1000 in 90 days. There are multiple offers out there, so check around. The card has a $69 annual fee, but that fee comes with 5,500 points. So after 3 years, you would have enough points for a free night for a cost of $207. Certainly not terrible, as long as you redeem for a high value night. Given the new chart, I would be surprised to see this signup deal get any better, and in fact we might see a decrease in the number of points awarded. Yes, Wyndham burned a lot of people in the past with their award chart changes. Today’s announcement shows that they are listening, and they’re making changes for the better.